Cristiano Ronaldo scored an eight-minute hat-trick in the first half as Real Madrid responded emphatically to the defeat to Barcelona by thrashing Granada at the Santiago Bernabeu. 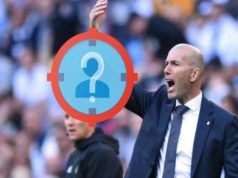 The Portuguese scored five in total, with Karim Benzema grabbing two and Bale adding another with Granada captain Diego Mainz putting into his own net in a 9-1 win. 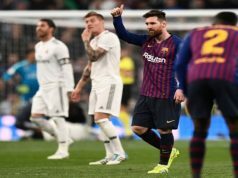 Los Blancos had been under pressure from the media and fans alike going into the game but the win suggests the players are up for the title fight and will go all the way with Barcelona for La Liga. The hosts welcomed back James Rodriguez to the starting line up for the first time in almost two months out with a broken toe and the fluidity and movement between him, Toni Kroos and Luka Modric was there for all to see as Real were back to their swashbuckling best. Granada, fighting at the foot of the table, starting brightly in an open game and flashed a couple of efforts wide in the opening exchanges. 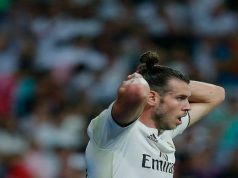 At the other end, Gareth Bale went close with a header and Alvaro Arbeloa missed an open goal after getting onto the end of a perfect Marcelo cross. But Bale calmed any nerves inside the stadium when he opened the scoring on the 25 minute mark. The Welshman had taken the brunt of fans’ anger in recent weeks and relieved the pressure on him with a clever finish. The forward ran on to Toni Kroos’ angled pass and held off defender Mainz before rounding Oler in the Granada goal to finish off from an acute angle. From then until the break it was the Ronaldo show. The Portuguese superstar grabbed his first after Mainz had bundled clear a Benzema chest down straight to him to smash home. He grabbed his second of the game, and 32nd league goal of the season a couple of minutes later when Oier to only parry a Marcelo cross to him. And on the 38 minute mark, the Ballon d’Or holder had his third, brilliantly cutting inside and firing home an effort into the top right hand corner. The hosts continued where they left off after the break, and Frenchman Benzema got himself on the scoresheet in the 51st minute, bringing down a Rodriguez corner on his chest before volleying home. Two minutes later it was six for Los Blancos. Marcelo’s raking diagonal pass over the defense was controlled by Bale who drew Oier off his line. The forward then unselfishly squared the ball to his Portuguese teammate to head into the back of the net. Karim Benzema added a seventh for Carlo Ancelotti’s men in the 56th minute after collecting a pass from Arbleoa, feigning a shot to deceive the keeper and slotting him. Granada did get themselves on the board with 16 minutes remaining when Roberto Ibanez beat the offside trap to race through and slot past Casillas in the Madrid goal. But it mattered little as minutes later, Mainz knocked it past his own keeper after failing to get out of the way of a Modric cross. Ronaldo scored his fifth in the final minute, heading home from a Modric free kick. Ancelotti will be delighted with his players but will know they will face tougher tests as the season draws to a close.